In an attempt to defile the animal rights movement, meat, dairy and egg-eaters often proclaim that Hitler practiced vegetarianism. 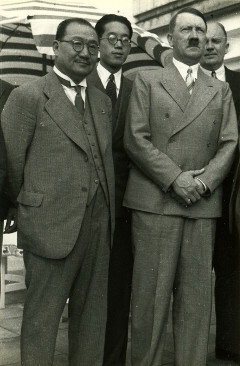 However, biographers Albert Speer and Robert Payne attested to Hitler's love for liver dumplings, stuffed squab [pigeon], ham and sausage in the following books: Inside the Third Reich and The Life and Death of Adolf Hitler. German Chef Dione Lucas wrote about Hitler's meat-eating in her Gourmet Cooking School Cookbook, published in 1964. Rynn Berry's Hitler: Neither Vegetarian Nor Animal Lover describes how Goebbels, The Third Reich's propaganda minister, tried to sell Hitler as a vegetarian to make him seem as peaceful as Gandhi, who was (and still is) adored by the world. Check out Berry's March 8, 2007 letter to the New York Times below, where he proves—beyond a reasonable doubt— what the top Nazis ate. Keep in mind, most concentration camps had animal slaughterhouses built right next to the human ones! And Heinrich Himmler, the Gestapo Commander who created the Jewish Holocaust's gas chamber system, was a mass murderer of chickens before orchestrating the mass murder of humans. 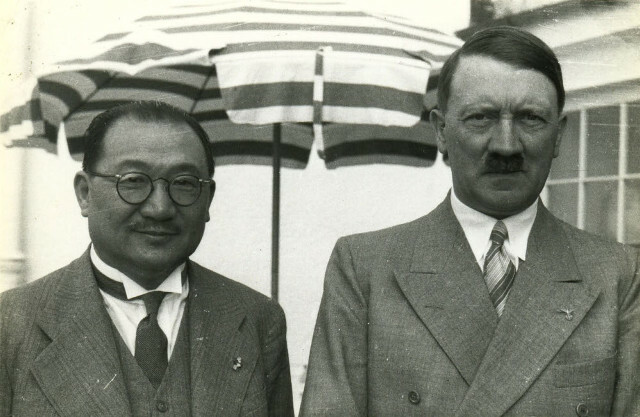 The fact that he enslaved and killed chickens for a living further exposes the 'Nazis-were-animal-lovers' scam. Before you read Berry's indisputable piece, I need to point out that Adam Lanza (Sandy Hook Elementary School shooter) is the only ALLEGED vegan mass-murderer I can locate. An acquaintance of his family made the claim shortly after the 2012 massacre, but that tenuous claim has yet to be verified to this day! Since Lanza’s mother and the FBI confirm that Adam spent nearly every waking hour online, wouldn’t there be a slew of evidence—some diatribe somewhere—straight from the killer’s mouth that he was vegan? But even if someone proved beyond a reasonable doubt that Lanza lived a vegan lifestyle, how does that offset the following mass-murderers who are all VERIFIED meat, dairy, egg and/or honey-eaters who also wore leather and other animal skins: Joseph Stalin, Saddam Hussein, Uday Hussein, Qusay Hussein, Muammar Gaddafi, Osama bin Laden, Pol Pot (Cambodia), Slobodan Milošević (Serbia), Idi Amin (Uganda), Josef Mengele (Nazi), Adolf Eichmann (Nazi), Charles Manson, Jeffrey Dahmer, John Wayne Gacy, Anders Behring Breivik (Norway), Eric Harris and Dylan Klebold (Columbine H.S. shooters), Christopher Harper-Mercer (Umpqua Community College shooter), James Holmes (Denver movie theatre shooter), Seung-Hoi Cho (Virginia Tech shooter), Richard Ramirez (the “Night Stalker”), Susan Smith (child killer), Timothy McVeigh (Oklahoma City truck-bomber), Elliot Rodger (U. of California-Santa Barbara shooter), Martin Bryant (Australia), William Unek (Africa), Woo Bum-kon (South Korea), Baruch Goldstein (Israel), Jack The Ripper (London), Jim Jones (Jonestown, Guyana, Massacre), Mitchell Johnson and Andrew Golden (Jonesboro H.S. shooters), and many, many more, including The Führer, of course! And check out this 2015 article detailing the last meals of McVeigh, Gacy and 13 other murderers and rapists. Wanna take a guess what those meals consisted of? I must take issue with Mr. Rothstein's glib characterization of Hitler and his Nazi henchmen, Hess, and Himmler, as vegetarians, in his review of Tristram Stuart's The Bloodless Revolution (February 25). As the historical advisor to the North American Vegetarian Society, I am constantly being taxed with having to explain Hitler's alleged vegetarianism. In researching the matter, I discovered that Hitler was not a true vegetarian. I presented my findings in a book entitled Hitler: Neither Vegetarian Nor Animal Lover (Pythagorean Publishers, 2004). To be sure, Hitler professed to be a vegetarian (in section 66 of Hitler's Table Talk, 1941-44), but the primary sources that I have cited in my book show that while he paid lip service to vegetarianism, he was not consistent in his practice of the diet. “Vegetarian”—which means (according to the standard dictionary definition) “the practice of eating only vegetables and refraining from eating meat, fish, or other animal products”—is like that other V word, Virgin: you either are one, or you are not. By that criterion, Hitler was a quasi-vegetarian, a would-be vegetarian, or a flexitarian. He was decidedly not a true vegetarian. Finally, to suggest with Tristram Stuart, as Mr. Rothstein does, that many Nazis were vegetarians [“Many Nazis, as Stuart suggests, were either vegetarians or interested in related issues”] is a gross distortion of the facts. The truth is that not one Nazi was a thoroughgoing vegetarian—not even Hitler himself. I hope that you will be fair-minded enough to print this letter so that readers may judge for themselves whether Hitler, Hess and Himmler were vegetarians. I'm afraid Mr. Rothstein's review is just one further instance of a pundit's publicly relishing the (false) paradox that a triumvirate of genocidal tyrants should have been the followers of a Gandhian diet. The photographs you see on this page have a connection to the developer of this website. George Lacks, a war correspondent and photographer for Life Magazine, shot these and many other photos of Hitler while Lacks was traveling through Europe with a group of Chinese emissaries. 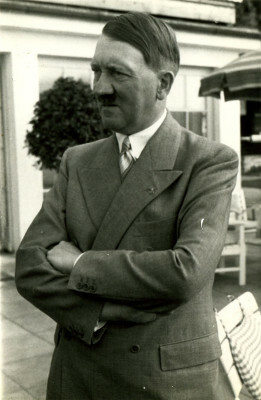 In June 1937 the group visited Hitler's retreat in the Berchtesgadener Alpen, and Lacks seized the opportunity to snap a few quick pictures of Der Führer in his own element. 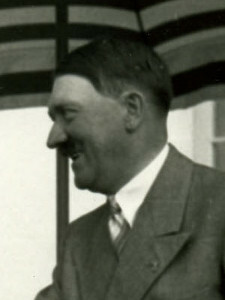 Lacks is believed to be the first American to photograph Hitler at close range. He was also the father of Gordon Brown, who built this website for Gary Yourofsky. For more photos of Hitler, as well as numerous other photos produced by George Lacks, please visit this website.